The edges of shadow harden. My blood turns to wine. Hush. The twilight hour, the fall of day. 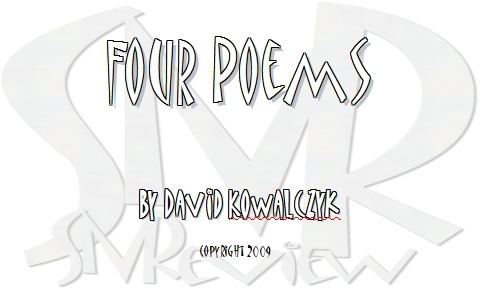 Copyright 2009, David Kowalczyk. © This work is protected under the U.S. copyright laws. It may not be reproduced, reprinted, reused, or altered without the expressed written permission of the author. David Kowalczyk of Oakfield, New York, has a M.A. in Creative Writing from SUNY/Brockport and a B.A. in English Education from SUNY/Buffalo. He has taught ESL in Quetzaltenango, Guatemala and Changwon, South Korea, and English Composition at Arizona State University and Genesee Community College, Batavia, New York. His poetry and fiction have appeared in seven anthologies, including Bless Me Father: Stories of Catholic Childhood (Plume, 1994) and in over seventy print and online literary journals, including St. Ann's Review, Taj Mahal Review, Istanbul Literary Review, and California Quarterly, as well as in the First Sunday Poetry Page of The Buffalo News. He was founding editor of the late Gentle Strength Quarterly.